How many big budget games in the past 1 year have not been First Person Shooter games. Well, so few that you can almost count them on one hand. What is the reason behind such an onslaught on FPS games in the market. Their immense popularity and the in-general cannot miss game just like a horror/mystery genre in movies. When publishers consider that they need to sell over a million copies of a game whether for Xbox 360 or a PlayStation 3 platform, to turn profitable, risk with coming out with a new kind of genre is generally not part of the equation. First Person Shooter games are generally the safe bet these days and no publisher knows it better than UBISoft which is why it is all the more surprising for them to go out on limb on Assassin’s Creed, one of the most innovative and imaginative games to be released in years. We will get one thing out of the way first. There is a huge twist that we are not going to ruin it for you … and the story score has been rated with this in mind. With disclaimers out of the way, we can talk about what amounts to 90% of the experience. You play as Altaïr (Arabic, “The Flying One”), a member of the Hashshashin sect. Altair and his allies are in search of a great treasure when they suddenly come into contact with a rival group who are also trying to get hold of the treasure. A confrontation ensues and Altair ends up on the short end of the stick. Turning to his master with his tail between his legs, he is stripped of his rank and weapons and is forced to earn them once again. To do this, he must locate and assassinate nine different leaders who are spreading corruption throughout the land. While we won’t mention what the twist is, we can say that it provides something in a video game story that is rarely present : duality. Altair’s main quest presents the player with moral issues that cloud the waters between right and wrong making for a thoughtful and clever story that will keep you guessing till the end. Once Altair loses his abilities and equipment, the game gives you the opportunity to earn stuff back. As he polishes off his targets, some of them are restored to him. However, he is not a walking arsenal. His instruments are simple… yet effective with a sword, throwing knives and a hidden blade as his only death inflicting devices. When you launch the game, initially, it can be a little confusing.You will discover horse travel, which will allow you to traverse the kingdom in search of the game’s three cities slicing enemies along the way. Once you visited all the three cities, you will have the option to simply morph there which is good considering the miles of terrain separating them. Once inside a city, there are a series of strict events you must complete. First, you must visit the local Assassin’s bureau to gather information and whereabouts of the target. The second step is to climb tall structures to survey the area. This will plot points on your map for other lookouts and mission objectives. The third is to complete the mission objectives. Although there are six investigative objectives total per hit, you are only asked to complete two or three before moving onto the next step which is the actual assassination. Mission objectives aren’t exactly varied and this process kinda repeats throughout the course of the game. By the end, you will have had your fill of roughing up people and extracting information and talking to informers. Calling Assassin’s creed as an open ended game is a bit of a stretch. While you have your choice of missions to complete out of the six and you can choose the order of the targets to assassinate, that is where basically the flexibility ends. You can also choose to complete side objectives like saving private citizens and gathering flags scattered throughout the city, neither of them is worth the effort. Assassin’s Creed will give you a game time of atleast 15 hours depending on your skill level, which is pretty deep by today’s standards. However, there is no online functionality to speak off. The gameplay in Assassin’s creed is basically broken down into two categories … navigation and combat. The game has been built to offer navigational freedom and the game definitely delivers. Altair automatically adapts to whatever hand and footholds are available in the environment. If you want to jump, there are no buttons to press and it can almost seem to easy until you have a dozen soldiers chasing after you and you have to navigate the terrain too. Jumping doesn’t require much input either. You can simply hold the right trigger and a button and it will automatically jump from one object to another. 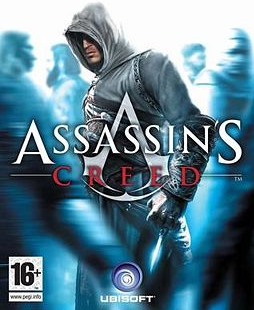 This robs you of the thrill of making moves at precisely the right moment making Assassin’s Creeds most exciting moments feel flat and feels like the game is being played by someone else. Unfortunately the combat doesn’t live up to the rest of the game mainly due to the moronic enemies. Once Altair regains the ability to pull off counter kills any intensity in the combat is basically lost. Counter kills are executed using the right trigger and tapping the attack button. The result is some of the most brutal sword attacks you will ever see and instant kills. There will be times when there are almost a dozen enemies surrounding Altair. Yet, they will all wait their turn to attack you watching comrade after comrade being slaughtered by you. As Altair makes his way around the city, he is under varying levels of scrutiny. He can choose to be stealthy allowing him to blend in with the local population. The issue here is that if you select the blend option, Altair might as well turn invisible. Suddenly enemies are oblivious to his existence resulting in some absolutely ridiculous moments. The counter kills are exhilarating but the brain dead enemies is definitely a total bummer. Grand Theft Auto was one of the first games to present a total city in real 3D. The city, streets and the environment in Assassin’s Creed are absolutely stunning. Characters completely interact with one another in a natural way. You have a recipe here that it has to be played to be believed. The game is filled with so much unpredictability that Altair never appears to move synthetically. The scenes where you view the entire city is breathtaking. The first half of Assassin’s Creed is something you have never played or experienced before. Overtime, repetition rears its ugly head and plus the brain levels of your enemies don’t challenge you enough. The potential here is undeniable but there has been some dust swept under the rug which places some blemish on an otherwise beautiful piece of art. Assassin’s Creed is available for PC, PS3 and Xbox 360. The game has been released on November 13, 2007. Posted in Gaming and tagged assassin's creed, Gaming, xbox 360. Bookmark the permalink.